Location: To the west of Stafford Road at Stafford Road Junction. Notes: Stafford Road was one of the early stations of the Shrewsbury & Birmingham Railway (S&B) opening in October 1850. The S&B was authorised on 3 August 1846 to build a 29 ½-mile line between Wolverhampton and Shrewsbury (10 miles at the western end being as part of a joint line with the Shropshire Union Railways & Canal Company). The original aspiration had been to create a route to Birmingham but opposition from other railway companies had prevented that from being achieved. Instead Parliament had authorised, also on 3 August 1846, the Birmingham, Wolverhampton & Stour Valley Railway (BW&SV) to build a line between Wolverhampton and Birmingham and given the S&B running rights over it. Because of this when the S&B opened to Wolverhampton on 12 November 1849 it ran into a temporary terminus at Wolverhampton. Stafford Road was located 70 chains from the temporary Wolverhampton terminus which was at Victoria Basin. It was to the west of Stafford Road and just to the east of the Oxley Viaduct which carried the line towards Shrewsbury. Little is known about the station as there are no known images of it and it does not appear on any maps. The station was served by trains between Wolverhampton and Shrewsbury of which there were six in each direction on Monday-to-Saturday in 1850. On Sunday there were two trains in each direction. On 24 June 1852 a permanent station was opened at Wolverhampton. It was a short distance south-east of the temporary station and a shared facility with the BW&SV. It would later become Wolverhampton High Level. Stafford Road must have proved to be unprofitable as the S&B closed it in July 1852. The BW&SV line had been leased to the London & North Western Railway (LNWR) on 2 July 1847 and they delayed opening it so as to frustrate the S&B. The LNWR feared an alternative route to its own being created from the West Midlands to the River Mersey which was exactly the aspiration of the S&B. Hostility by the LNWR resulted in the S&B seeking an alliance with the Great Western Railway (GWR) who also wanted to create a route to the Mersey. The GWR had reached Birmingham on 1 October 1852 and had then obtained an Act to build a line of its own to Wolverhampton. When the S&B moved into the GWR sphere of influence a further line was proposed from what later became Wolverhampton Low Level station to the site of Stafford Road station. This would allow S&B trains to reach Birmingham without the need to use the LNWR line. When work began in the GWR lines the LNWR realised it was pointless in resisting the S&B any longer and on 4 February 1854 they allowed its trains to run through to Birmingham New Street. 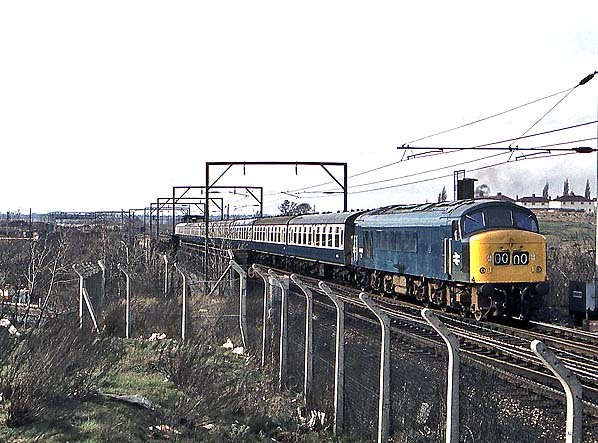 However the S&B ran only a few services in each direction. On 1 September 1854 the S&B was absorbed into the GWR. On 13 November 1854 the GWR line from Wolverhampton to the station site, which then became Stafford Road Junction, opened. From that date all former S&B line trains started to run to Birmingham Snow Hill via the GWR line. Some through carriages were operated from the High Level station to Stafford Road Junction where they were attached to GWR trains but only in the down direction. The GWR still had a half-share in Wolverhampton High Level station and they considered that it was commercially prudent to run some coaches from it. In November 1854 a platform was constructed at the junction to facilitate the attaching of the coaches. It was not accessible from the road and there was no reason for passengers to alight there. On 13 July 1857 there was an accident at Stafford Road Junction that was in part caused by the process of attaching coaches from the High Level station to down direction trains that had departed from the Low Level station. The accident occurred when an excursion train from Birmingham to Liverpool departed from the Low Level station at 9.03am and was stopped at Stafford Road Junction by a signal a few minutes later so that a coach from High Level could be attached. The excursion train consisted of a locomotive with tender, ten coaches and a brake van. A second excursion train, heading for Codsall, departed from the Low Level station at 9.08am. The train consisted of an engine with tender, 16 coaches, a brake coach and a brake van. Its driver had seen the Liverpool excursion train depart but he had no idea that it was going to stop at Stafford Road Junction. He had been ordered to stop at two extra stations before Wolverhampton and that meant that he was running three minutes late. In order to make up the time he made a fast departure from the Low Level station and picked up speed quickly. A switchman waved a red flag to the Codsall train to warn the driver that the Liverpool excursion was there but the driver and his fireman did not see it until it was too late to bring the train to a stop before it ran into the back of it. The collision occurred at 9.11am and 24 people were injured. In his report into the accident Captain H W Tyler RE criticised working practices and signalling on the line. In particular he considered the running of coaches from the High Level station to Stafford Road to be unnecessary as it was adjacent to the Low Level station. After the accident the GWR stopped operating coaches from High Level and in 1859 they sold their half-share in the station to the LNWR. By the end of 1859 the platform at Stafford Road had gone out of use and it was probably removed at about the same time. The junction between the former S&B and the BW&SV lines was disconnected and the original S&B line into Wolverhampton became a goods branch that continued to serve Victoria Basin. 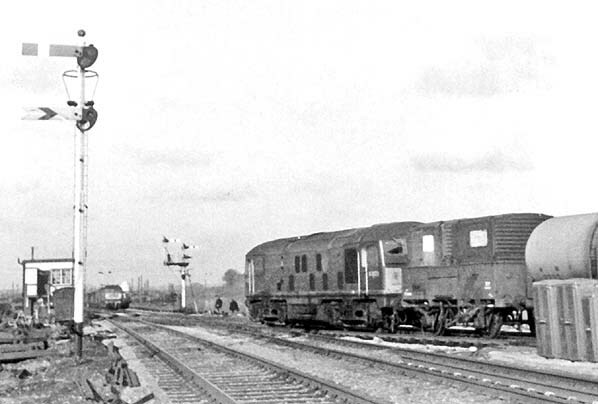 Over a century later in 1967 the situation reversed when trains from the former S&B line were diverted to run along the original line and through Wolverhampton High Level. Wolverhampton to Shrewsbury - Vic Mitchell & Keith Smith - Middleton Press 2009. The site of Stafford Road station looking north-west in March 1967. The photographer is looking along the course of the original Shrewsbury & Birmingham Railway on which the station stood. Coming off the 1854 GWR line is a Sulzer Type 2 locomotive number D5020 on a mixed goods train. 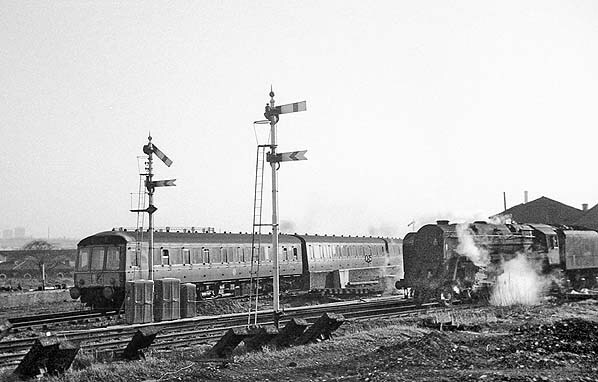 The opening of the GWR line created Stafford Road Junction which the train is about to pass over. A six-inch scale map from 1886 showing the location of Stafford Road station long after it had been closed. The station was at the point where Stafford Road Junction is shown but in the period when it was open there was no junction at that location. The line seen curving off to the east was opened by the GWR in 1854. It became the main line and remained so until 1967. The site of Stafford Road station looking north-east in March 1967. The station was located on the line in the foreground. Standing on that line is a BR Standard Class 9F locomotive. On the 1854 GWR line a DMU on a Wolverhampton Low Level to Wellington service can be seen. 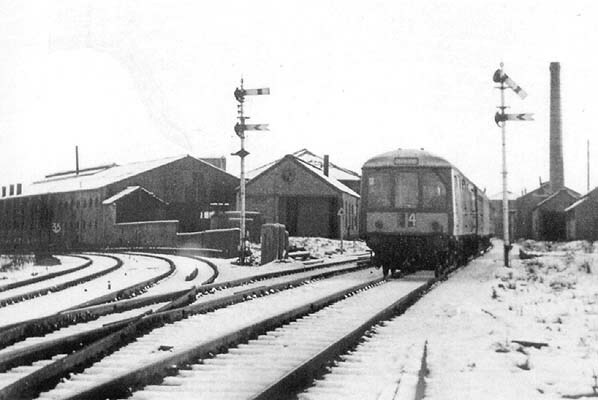 A view looking south-east at the site of Stafford Road station in January 1969. A Wolverhampton High Level to Wellington DMU is seen passing through the station site. It is on the original Shrewsbury & Birmingham Railway line which ceased to be a main line in November 1854 when the line seen curving to the left was opened by the GWR. In 1967 the situation reverted to how it had been prior to 1854 and when this view was taken regular passenger services had ceased to run over the GWR line. The site of Stafford Road station looking north-west on 28 March 1976. A view looking north-west towards the site of Stafford Road station in March 2016 from the former GWR main line. 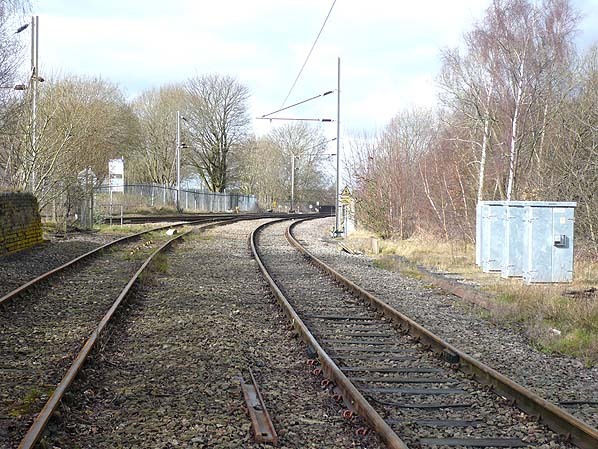 The original station was on the line which can be seen running left to right at the point where the metal fence can be seen. After the GWR line had opened in 1854 a platform was erected at this point to facilitate the attachment of coaches from Wolverhampton Low Level to down direction trains from Wolverhampton Low Level. This practice had ended by 1859 and the platform was removed.